No, this is not a mirage. There's no need to rub those eyes to make sure you're seeing it correctly or to pinch yourself to wake yourself up from a dream. 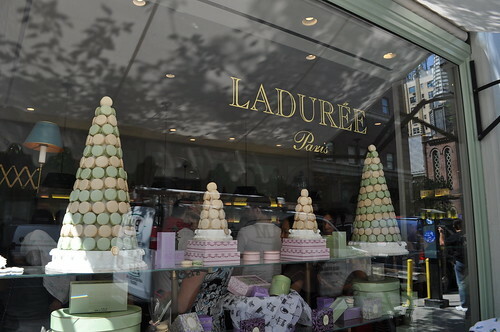 The famed French macaron shop, Ladurée, has finally crossed the Pond and reached the island of Manhattan, where its flagship set up shop over on the Upper East Side earlier last week. 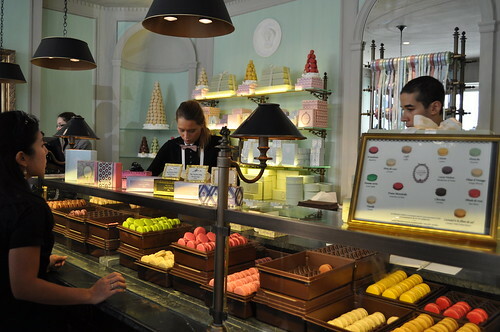 Just a little background about Ladurée before I get into the details of the dainty treats offered by the establishment. Parisian tea salons and their history are intimately tied to the Ladurée family. Back in 1862, Louis Ernest Ladurée, a miller from the southwest region of France, opened a bakery in Paris. During the same time, the Garnier Opera had just begun its construction and the surrounding area was "rapidly developing into one of Paris's most important and elegant business districts, where prestigious names in French luxury goods had already taken up residence." So just as Ladurée's locale in Paris, the Ladurée here in New York City is located on Madison Avenue, where it is famously lined with premier designer flagship stores and haute couture boutiques, making it the ideal area that mimics its original (former) Parisian headquarters. 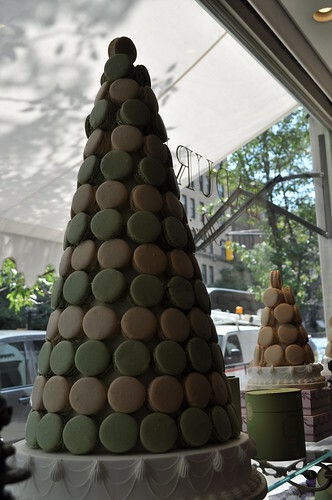 Look at those delicately assembled macaron trees! Beautiful! 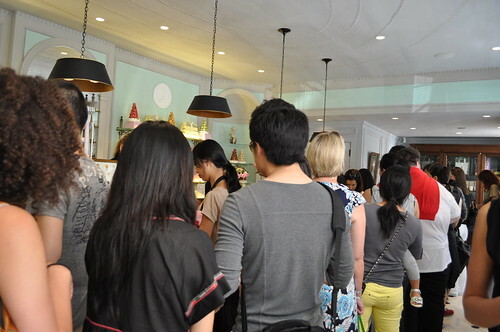 Here is the length of the line when we arrived to Ladurée on a Friday afternoon, around lunch time. It looped through the store about twice, making us luck out because I had heard the lines were going out the door and around the block the first few opening days. We waited a little under a half hour until we reached the counter to place our order for macarons. 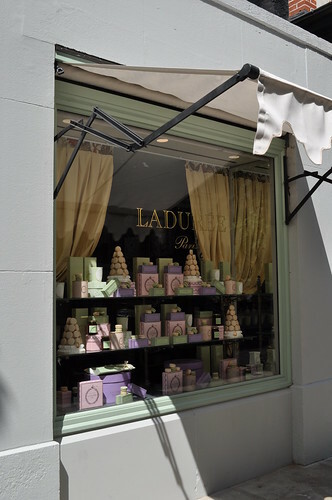 So to continue on about the history regarding Ladurée -- in 1871, during Baron Haussmann's "face lift" of Paris, there was a fire that resulted in the transformation of the bakery to a pastry shop. This pastry shop was decorated with the expertise of Jules Cheret, a famous painter and poster artist at the time. Mr. Cheret found his inspiration from the painting techniques used for the ceiling of the Sistine Chapel and the Garnier Opera. The incorporating of these elements in his work for Ladurée, he "added depth and relief to the ceilings and ornamented with cherubic children." Over time, the cafés in the area developed and became more and more luxurious, thereby attracting Parisian high society, eventually becoming the "showcases" of the French capital. The beginning of the twentieth century was when Mr. Ladurée's wife, Jeanne Souchard, had "the idea of mixing styles: the Parisian café and pastry shop" together gave birth to one of the first tea salons in town. This was also at a time that Parisian women were also changing, where the desire of making new acquaintances came to the surface. Accordingly, the salon de thé (i.e., tea salon) had a "definite advantage" over the cafés: it permitted ladies to gather in freedom. 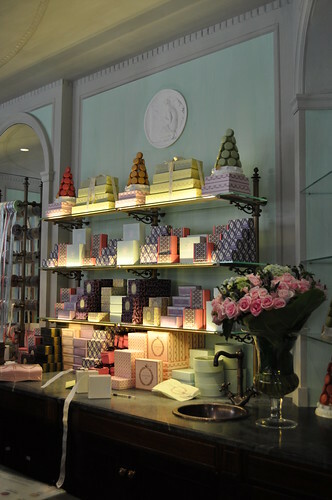 Since then, David Holder, and his father, Francis Holder (founder of the Holder Group), bought the institution in 1993 where the father and son had plans to promote and enlarge the famous "Maison" of Ladurée. The result -- a new prestigious Ladurée (both a restaurant and a tea room) opened on the Champs-Elysées in September 1997. David Holder's mission for Ladurée is "bring back the great classics" (especially the salon de thé) as well as "to create an environment for gastronomic creativity in Paris." Under his leadership, Ladurée has become a tea salon, pastry shop, restaurant, chocolate shop, and an ice cream parlor in Paris. 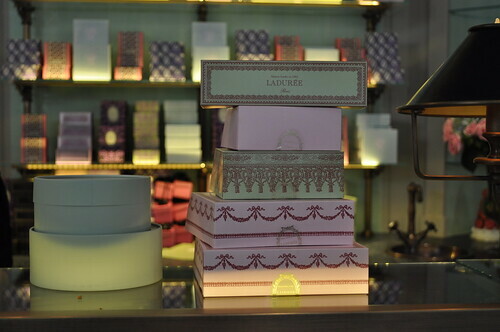 Some of the pastel-laden pastry boxes to hold the dainty treats with which you hope to leave the shop! 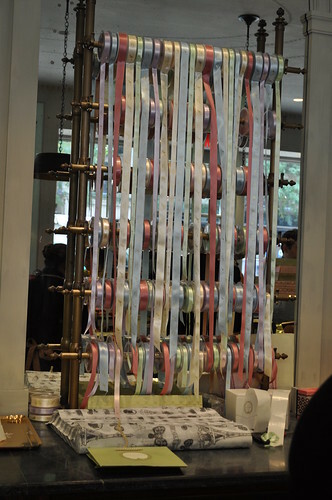 Plus, all the ribbon used to tie up those boxes with pretty bows! The macaron counter, where it appears the macarons are stored in these special containers, all stacked atop of what seems to be cold stone slabs in order to keep the macaron fillings from melting. What is even more interesting is that the macarons (along with all the other things offered for sale in the shop) are shipped overnight directly from Paris to New York! How incredible is that?! When the rumors were popping up all over the foodie e-universe, there were concerns about the shop and its highly desired goodies. Would the the shop would make the macarons in-store? And if so, how did the company plan on selling these French pastry masterpieces in the States without compromising the practically perfect construction and quality of the ones sold in the Champs-Elysées shop? As macaron enthusiasts know, the baking and construction of these meringue cookies is contingent on so many factors that if one little thing is off (humidity, ingredients, measurements, recipe procedures), the entire cookie suffers. For all we knew, then, the moodiest cookie in the world (as best said by the pastry chef who taught the macaron-baking class I took at the Institute of Culinary Education), especially the ones at the highly-sought after Ladurée, could somehow magically depend (but not at all surprisingly) on French butter and Parisian air. Once the question of imported macarons was settled, the next question rested with whether these macarons from Paris would be everything they are supposed to be. Would the air travel impair the taste/texture/consistency of the macaron? How much more expensive would they be compared to the domestic macarons to which we have become accustomed? Would the import costs dissuade potential customers from purchasing them? Marcus and I were determined to find out. 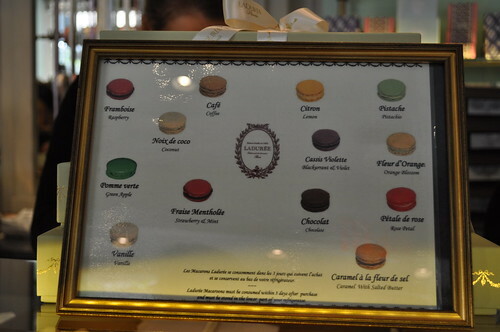 The color-coded menu of thirteen macarons offered at Ladurée -- the flavors listed here are pretty permanent all year round. With each new season, Ladurée pays tribute to its most famous creation, the macaron, by creating a new flavor. The company says "its existing range of macarons is always the starting point when a new one is created, as a variety of colors is as important as the range of flavors and a vital part of their appeal. So a bit more history on the macarons of Ladurée -- at the beginning of the twentieth century, Pierre Desfontaines, second cousin of Mr. Ladurée, first thought of taking two macaron shells and joining them together with a ganache filling. The spirit of this first macaron carries through today, as these pastries are made every morning in Ladurée's "laboratory," where pastry chefs measure out all ingredients precisely and add "a pinch of unique 'know-how' that is essential to the making of such a delicacy." Once cooked and piped, the macarons are put aside for two days before going on sale -- what Ladurée refers to as "the time to achieve a perfect balance between texture and flavor." A close up of the vessels that hold the beloved macarons. Marcus and I decided to order one of each flavor (thirteen in total, of course), in order to properly assess the shop's full repertoire of flavors available. After getting through the line and arriving home, our macarons made it to our dining table without any macarons melting or becoming crushed. The box that held twelve of our thirteen macarons (only had capacity for so many). The spillover macaron was placed in this mint green pastry bag. The first ones we tasted were café, vanille, and noix de coco. 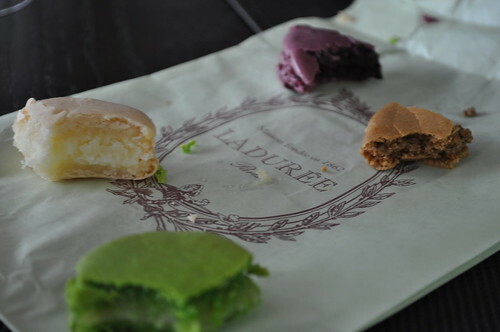 The first bite into the café proved all the hype Marcus and I kept hearing about Ladurée -- the cookie's texture (as with the rest of the macarons) was airy and had just the right amount of "crumbly." It was everything we thought it would be and more -- there is just that little somethin' about Parisian air that makes all the difference between these imported macarons and the domestic ones Marcus and I have explored throughout the city. For the Goldilocks of macarons, these were "just right!" As for the flavor of the café, I found it to be bold (in a good way), while Marcus thought it was a bit more subdued in comparison to the vanille, which we had after. The vanille was light and creamy while remaining super fragrant and strong in taste. It was like heaven in a macaron, almost like a vanilla-infused cloud. As for the noix de coco, we both found it to be soft like the vanilla, only with many coconut shavings and a definite coconut taste. The center for these three macarons were ganache. Out of these three, we found vanille took the cake in taste and texture. The next one we tasted was the pomme verte, which was very strong and biting in a way that Marcus and I disliked. It felt like I was having straight apple sauce in between the macaron cookies. 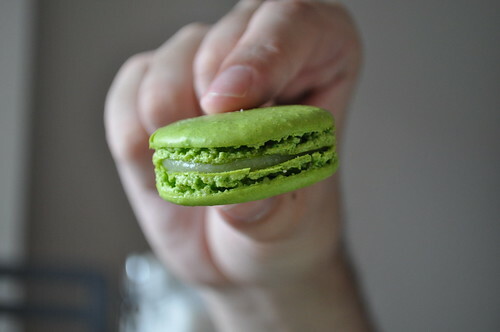 It was also very overwhelming in apple flavor -- not at all what I expected in a delicate Parisian macaron. A no-go from us on this one. Next, we had pistache, which was just as amazing as the vanille, only with very nutty and grainy buttercream from the fresh pistachios contained within it. Cassis violette had a very strong and concentrated black currant flavor contained in its jelly center, where I could barely make out the violette. This wasn't much of a loss to me seeing as I really like black currant-flavored macarons anyway. This particular macaron would go really well with a nice glass of sparkling wine, kind of like a faux kir royale! Citron was lovely, too, as it was creamy and refreshing with the subtle zing of citrus (not at all sour!) 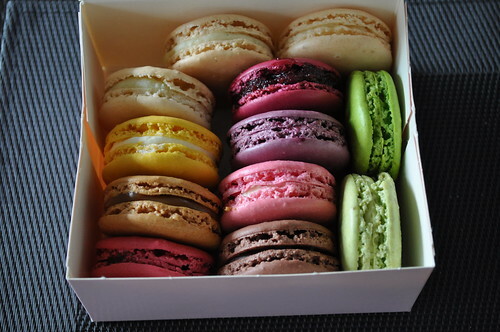 -- what Marcus referred to as a very light-hearted and tart macaron. The caramel à la fleur de sel was next, which we found to be pretty good and pretty on par with similar ones we've had at other macaron shops in the city. We finally got to chocolat, when we both declared it to be the best "chocolate-flavored" macaron we've ever had, where its ganache center tasted like those gourmet chocolate truffles. When we got to fleur d'orange, we weren't sure what we were tasting until we checked its color against the menu. We found it to be purely texture and mostly light in taste (not much flavor at all). Our friend Jess had previously told us it kind of tastes like honeysuckle to her, so we probably got a subtle hint of that here. With three more remaining, we went with the fraise mentholée, which after the first bite, had both Marcus and I immediately react "No, no, no!" in unison. It tasted awful to us -- so much so, that Marcus described it "as if I scraped out the contents of a strawberry Pop-Tart with a candy cane and ate it." I couldn't have put it in better words if I tried. So trust us, if you don't want to taste a strawberry-flavored Peppermint Pattie, don't get this. We urge you to please save yourself. Pétale de rose had a similar effect on us -- it tasted like I had stuck a bar of soap in my mouth and began to chew. Not good. I think it's mostly because Americans don't really have physical rose petals (or its infusion of aromatic essence) exhibited in our cuisine. It is probably an acquired taste that I definitely haven't acquired yet. The last macaron we had was the framboise, and we really enjoyed that one. It had that tart berry flavor and the refreshing crunch of raspberry seeds within its jelly center. It was quite concentrated with flavor, but I like the tart taste of berries, so it was right up my alley. 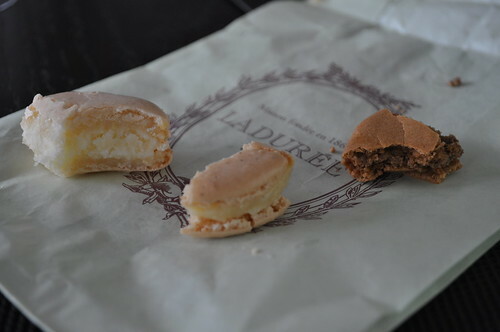 Findings: I still find it so unbelievable that Ladurée has finally arrived to New York City, let alone all of its culinary goodies are imported directly from Paris. Fortunately for macaron fanatics all around, nothing has been compromised from the overnighting of these macarons across a body of water. 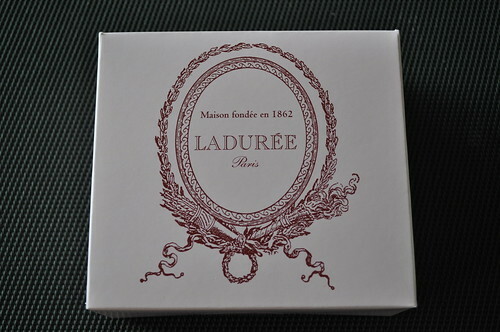 Upon hearing that these macarons are shipped directly from Paris, I was concerned the price point would be extravagant to the point where a visit to Ladurée would be either a one-time thing or only for super special occasions. But this was yet another surprise. It was only about a $0.20 mark-up to the prices we had already been paying for these addictive French pastries. What a steal for real-McCoy, authentic Parisian macarons! Additionally, you can definitely tell the dreamy consistency of the Ladurée macarons are just as airy and light as everyone who has visited the Parisian shop. From my eyes (or more accurately, my taste buds), the cookie part are practically perfect, giving me the audacity to say that they should be the benchmark that every macaron should meet. Only "downside" (if it really is one) is that there are a limited variety of flavors available daily. With the exception of showcasing a new flavor each season, it seems as though the menu is pretty fixed in that regard. Nevertheless, I am sure you will find your favorites and stick to them. Just be wary there may be a line! Lastly, I would advise you to stay away from the pétale de rose, the fraise mentholée, and the pomme verte. Unless you've become accustomed to those flavors and/or textures before, they are quite shocking and overwhelming in bold flavors that may not appeal widely to the general public's taste buds -- so you've been warned! 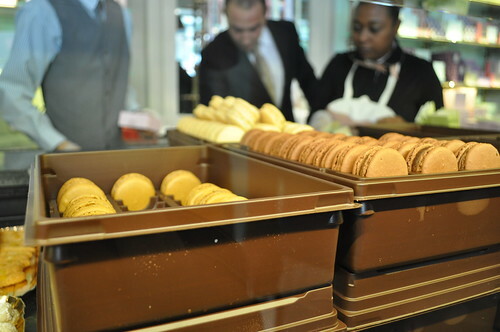 All in all, Marcus and I really enjoyed our long-awaited journey through the flavors of Ladurée macarons -- they were everything we dreamed it would be and more. 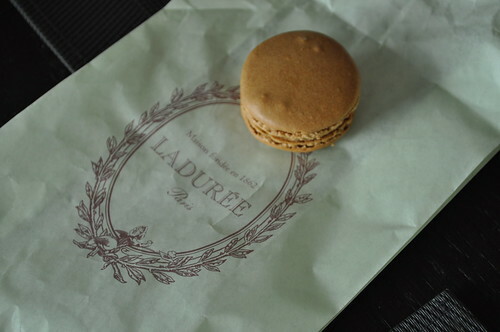 I still need to make it to Paris one day, but a trip to Ladurée will sate my wanderlust for now. The airy meringue along with the array of fruity and buttery fillings are as close as you can get to savoring the character of Parisian air and the savoriness of fresh French butter. Plus, can you really say anything bad about delightful French pastries that are daintily placed into playful, pastel boxes and then wrapped in iridescent ribbons in the prettiest little bows? Yeah, I didn't think so either :P! Price point: $2.70 for each macaron.